One of the greatest benefits of visiting Naples is its close access to many nearby beaches, cathedrals, museums, and UNESCO World Heritage Sites. Italy’s central coastline offers stunning natural scenery which continues to draw millions of tourists from around the world who come to eat, drink, and be merry under the silhouette of Naples historic past. Whether you’ve come to Naples to taste the region’s famous pizza, explore the elongated coastline, enjoy a cultural performance, or learn more about Italy’s rich heritage—there’s never a dull moment in your adventure with Ciao Florence. Embrace the spirit of “dolce vita” or the “sweet life” as our expert guides take you on a perfectly curated journey around the region of Campania. Florence based Tour Operator offers 11 different day trips from Naples to choose from, allowing you to tailor your Italian experience to satisfy your wanderlust. 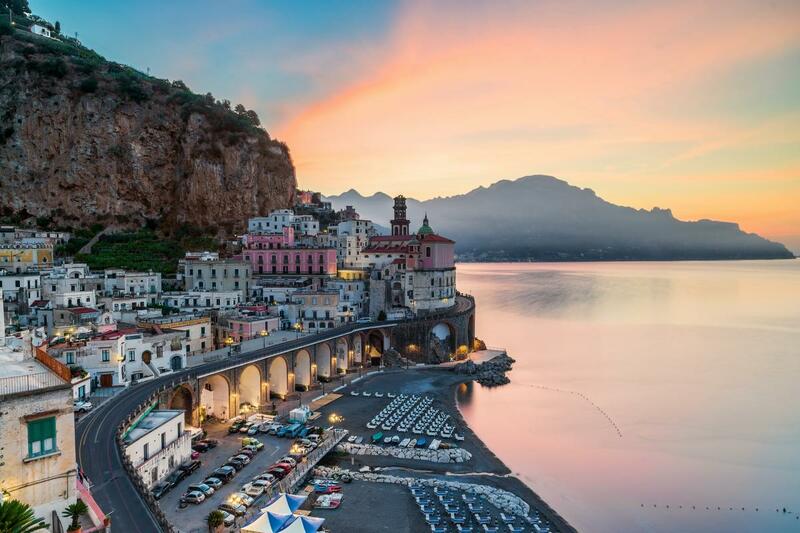 Indulge in the beautiful tranquility of the Italian countryside as we travel by bus, train, and even boat to cities like Pompeii, Capri, Sorrento, and the Amalfi Coast. Along the way you will be given lots of time to explore these cities for a more intimate connection to this historic Italian landscape. Whichever route you choose, feel confident that you are getting the most out of your Italian experience when you travel with Ciao Florence. Visit the UNESCO World Heritage Site of Pompeii which was made infamous in the volcanic eruption of Mount Vesuvius in 79 A.D. The prosperous people of ancient Pompeii had become accustomed to frequent earthquakes in the region, eventually coming to ignore warning signs of their city’s demise. 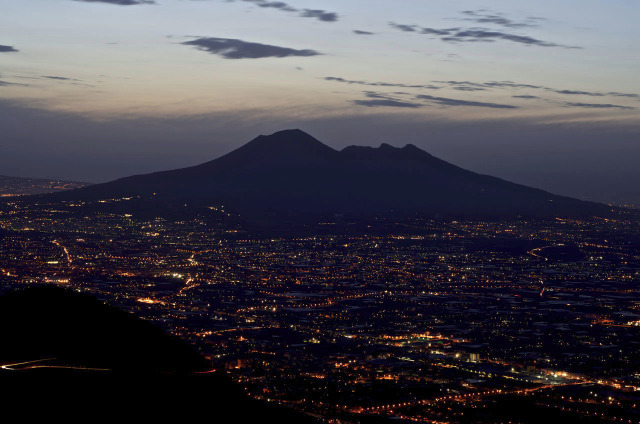 After all, the Vesuvius volcano had laid dormant for over 800 years. Then one day the powerful volcano suddenly exploded - promptly burying almost 1,000 citizens in an eruption of fire and ash. The surrounding landscape, once tilled as rich and fertile land, was reduced to a charred black slab of destruction. Pompeii remained hidden for over 1,500 years before the city’s ruins were finally discovered by a surveying engineer in 1748. The city was hidden beneath layers of volcanic ash, which offered protection against the natural elements for thousands of years and allowed the ruins to remain in almost pristine condition. Today, the city of Pompeii alongside other hidden cities like Herculaneum, Stabiae, and Oplontis allows us an opportunity to glimpse back into ancient Roman life and customs. Explore the ashy ruins and learn about the common Latin dialect spoken by ordinary villagers as you imagine what life would have been like in 1st century Italy. 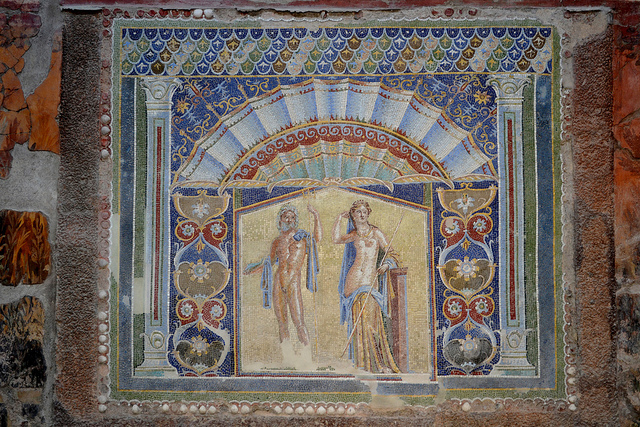 Some of the highlights of our Pompeii tour include visiting ancient thermal baths, the Basilica and Macellum, and the famous House of the Faun. 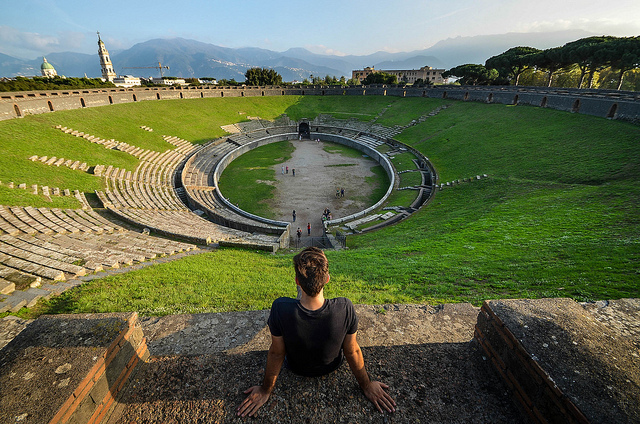 Your guide will be able to tell you more about the historical significance of Pompeii, its archaeological footprint, and answer any questions you may have. For those who like to draw historic connections, travel to both Mount Vesuvius and Pompeii for a more complete picture of that immortalized day in 79 A.D. There have been 41 eruptions since that deadly eruption, none of which carried the same force and the latest happening in 1944. Enjoy a breathtaking boat ride out to Capri, where you will be greeted by a range of attractions to suit all traveling types. You will first pull into port at Marina Grande, home to the biggest beach on the island famous for its clear and gentle waters. From Marina Grande we move up the island’s steep precipice, where there are many more hidden gems to explore. Whether you’re an avid hiker or a public transportation enthusiast, there are plenty of options to help you comfortably explore this Italian island. Spend your time lazily wandering among cafes, shopping at designer boutiques, or watching local fisherman at the marina for a true sense of local culture and art. Nature lovers will enjoy the botanical gardens of Giardini di Augusto which showcase the local flora and fauna of Capri. 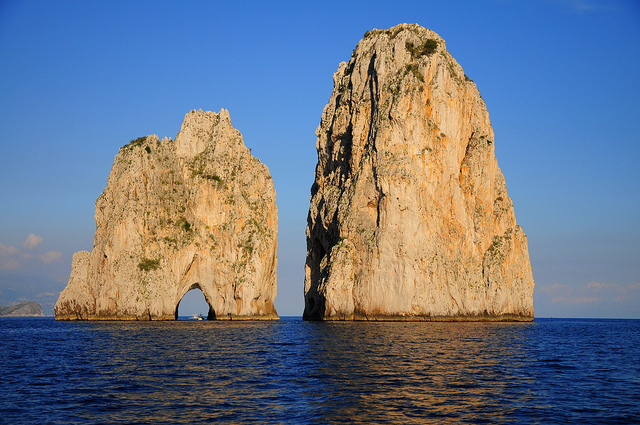 The entire island is made up of one giant limestone rock, with several interesting formations including the iconic three pronged Faraglioni off of Capri’s southern coast. However a trip to Capri wouldn’t be complete without paying homage to Italy’s rich heritage. Step back in history with a pleasant walk around Neolithic, Greek, and Roman ruins scattered throughout the island which are living monuments to humanity’s continued progress. You also have the option of travelling to the island’s second biggest city of Anacapri. There you can take a chair lift to Monte Solaro for some incredible views of the Mediterranean Sea along the Italian coastline. Our knowledgeable guides can help guide you towards the best places in Capri to suit your interests, while also providing invaluable information about local crafts and foods to try around the island. There are perhaps few landscapes more dramatic than that of the Amalfi Coast. 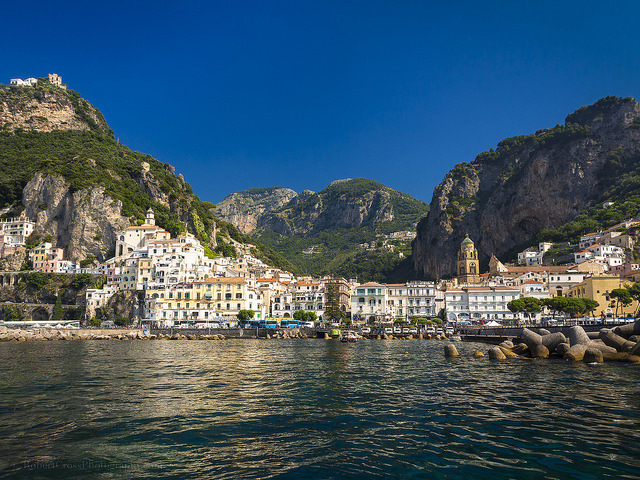 The Amalfi Coast was named a UNESCO World Heritage Site in 1997 thanks to its rugged shoreline, charming pastel hued fishing villages, and dramatic terraced vineyards. The region has become a popular setting for many television programs and movies, and continues to rise in popularity as a luxurious travel destination in Italy. 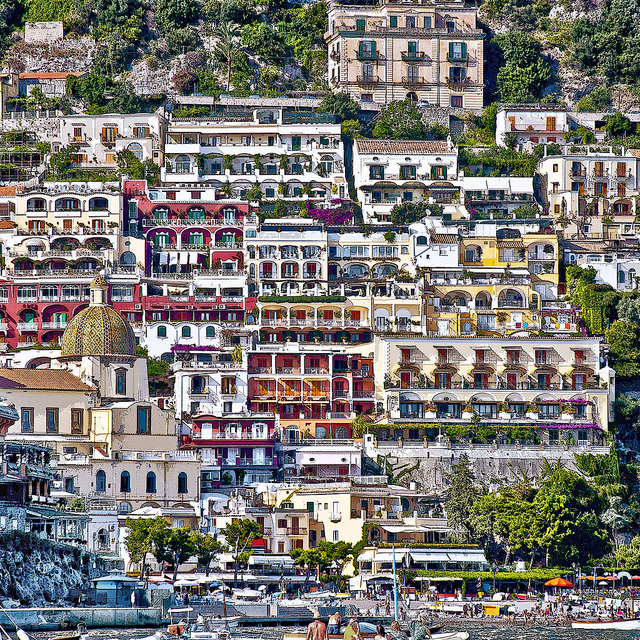 Some of the more popular towns include Positano, Ravello, and Amalfi which see a huge influx of tourists between April and September. 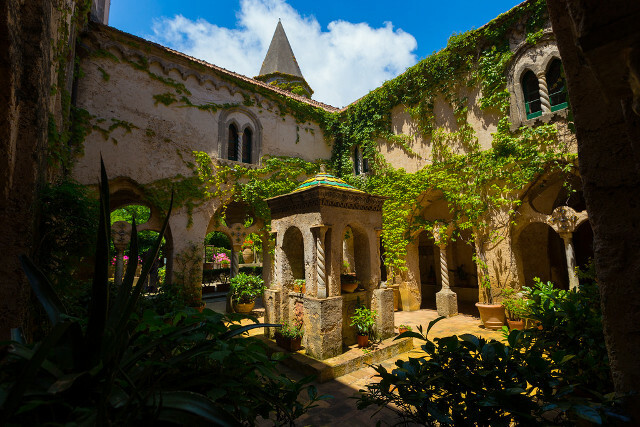 Throughout your exploration in the Amalfi Coast you will be guided by one of our local experts, who will explain the landscape, history, and culture of this celebrated Italian region. Our experienced drivers will also navigate you around the 50 miles of back country roads as you enjoy views of the Mediterranean Sea on one side and the Lattari Mountains on the other. Just a short drive along the Amalfi Coast north leads us to the city of Sorrento, a picturesque costal town which has been a popular retreat for thousands of years. It is rumored that Caesar Augustus once had a villa along these cliffs, however the original structure has long vanished. Today, the city of Sorrento is characterized by small alleys and workshops, creating all manner of crafts and textiles which are great options for an authentic Italian souvenir. Relax as our guides show you around the winding streets which were designed in such a way so that the sun would be blocked from pedestrian view. This makes Sorrento a perfect destination to visit in the sweltering summer months. 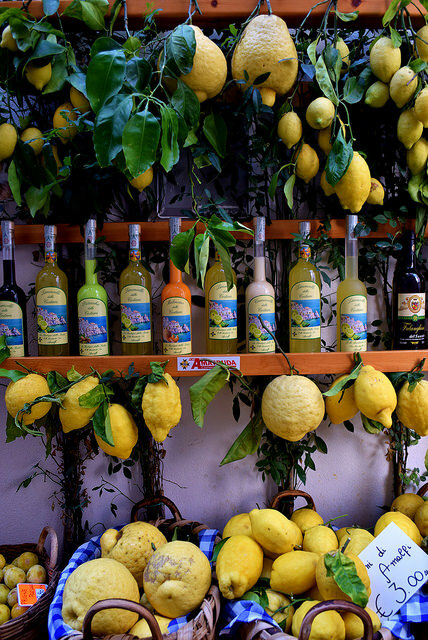 Sorrento is also famous for its lemon trees which permeate the air with a citrusy perfume. The lemons are considered some of the finest in the world thanks to the mineral rich soil from Mount Vesuvius. It is from these lemon trees that the Italians first started making the popular sweet liqueur known as Limoncello, which you can taste at almost any restaurant within the city.